I'm taking a break from ghosts tonight to explore the other side of the paranormal. I'm also exploring a part of local history I was entirely ignorant of until yesterday night. 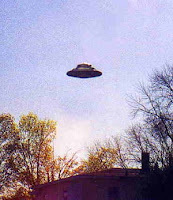 In the winter of 1989, for one night, the skies of North Alabama were filled with UFOs. North Alabama is not Arizona and UFO sitings are not common here. Alabama has had its share of fleeting encounters with UFO's but nothing like what happened in Fyffe Alabama on the nights of February 11th and 12th. On these two nights there were over fifty reports of strange, spectral lights in the skies of this tiny Alabama town of less than two-thousand. There were reports and multiple photographs and a plethora of witnesses who supported the reports from that night. Police report responding to these lights. They went out looking for them. Several officers investigating the lights even describe attempting to chase or apprehend the lights. Officers on the scene describe the flying objects as triangular shaped and utterly silent. The chief of police was completely mystified by these objects. "What I saw the first time was like nothing I ever saw before. It was not a helicopter not a plane. Not a sound" Chief Garmany stated. Fyffe was not alone. That night in nearby DeKalb County there were eleven reports of UFO sightings. Dekalb county police also investigated the reports and were able to witness the strange objects. Officers called the weather service and the military to make sure that the objects couldn't be explained by some obvious answer, but their investigation only gave them more questions. After calling every airport, military base, and weather station in the area no answers were found. Following those nights of UFO sitings, Fyffe exploded with a kind of UFO mania. People came from all over to catch a glimpse of the strange objects. T-shirts were sold and reporters filled the hotels, but the skies were quiet. There was never any explanation for the multitude of siting by so many people that night and many believe that North Alabama was visited by Aliens that night.